We’re Back! And in Georgetown! It’s gonna feel good to come home! Fifteen years ago, The Bad Things started making noise in a Georgetown factory and performing ramshackle live performances at the local watering hole, the 9LB Hammer. Georgetown was a different place then but the Hammer remains true to the neighborhood’s original spirit. A spirit which birthed this band. A little punk. A little blue collar. A little weirdo. And a little old-timey. It’ll be just us all night long so expect a night of dusting off old nuggets from the past, playing old favorites and throwing in a few covers here and there. As always at the Hammer, there is no cover so that means you have no excuse not to be there. We always seem to play well when we’re there. Feels like home. This is also your only chance to see us this fall as we are not doing Cabaret Macabre this year. As sad it is to say, that event ran its course, had a good run but don’t worry, we’ll be doing more cabaret-themed shows in the future. We’re not that easy to get rid of. See everyone on Saturday, September 23rd at the 9LB Hammer – 6009 Airport Way South. If you want, go ahead and RSVP on the Facebook page. Goodbye Daniel Adam Driskill. We’re Sure Gonna Miss You. Seems like this band has played too many memorials in the last two years. It was at the memorial for the Cafe Racer shootings at The Neptune Theater that Daniel Adam Driskill told me he’d been diagnosed with brain cancer. It seemed like somehow, this special little community we’d built was disappearing around us that night, for all the wrong reasons. Ironically, this was happening on a night when so many of those bands in that community were playing to probably the biggest audience they’d ever played to. The thought of Daniel not being in the front row of Bad Things shows, closing his eyes, bobbing his head, holding his beer to his chest, looking content and totally wrapped up in our songs, that’s the ultimate compliment you can pay to a musician, just listening and appreciating what you do. And Daniel gave that to us every time, for years, pretty much from the beginning. He made us feel special and for that, we all had a special place in our hearts for the guy. Reading the posts on his Facebook page, I see he had that effect on a lot of people and definitely with a lot of other bands. A true fan of the music. Tried and true. Tomorrow, we will get together at The Highline on Capitol HIll with an army of fellow musicians and friends and family to remember this gem of a man. 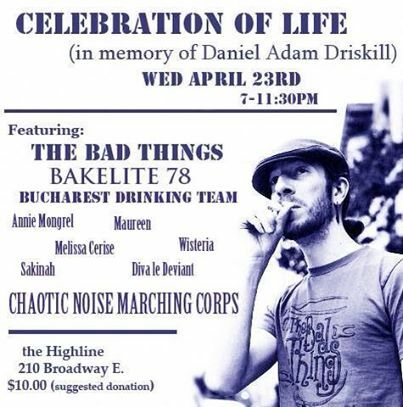 Folks like Bakelite 78, Bucharest Drinking Team, Chaotic Noise Marching Corps, Mongrel Annie, Melissa Cerise, Diva Le Deviant and more will be providing entertainment. Sure to be a big night of music, tears, memories, smiles, more tears, more beers and drunken singalongs….something Daniel loved. It’ll be strange not to see him swaying arm and arm with the drunks during “Death of the Inferno” but, you know what? I’m betting he’ll be there all the same. He wouldn’t miss it. Love you buddy and we’ll see you on the other side. P.S. If you’re coming to the show tomorrow, bring cash. His family and loved ones were left with some stiff hospital bills and expenses that need to be taken care of. All proceeds of the door are going to the cause but bring extra so that Daniel’s loved ones can focus on their grieving. Daniel Adam Driskill in all his glory! Friday, January 13, 2012 at The Comet Tavern. Photo by Jon Roy. Second Stop on our North to South Seattle Tour? Eastlake! Thanks to everyone that came out to Conor Byrne’s last Thursday. We had a great time. Gold Hope Duo were great. Gramps was his usual amazing self and we did what we do to a happy, dancing Ballard audience. Now that the first leg of our North to South Seattle Tour is complete, time to start preparing for our next couple appearances in town. 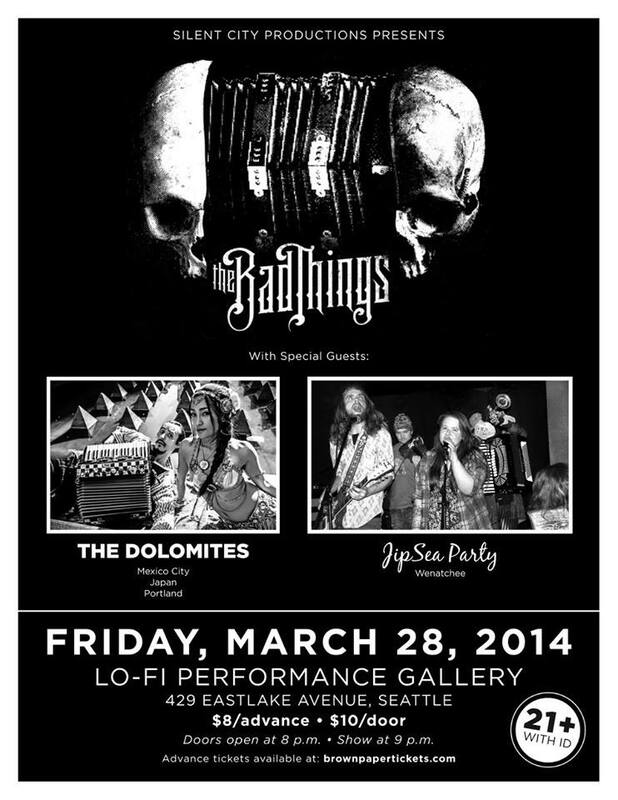 First of all, we’ll be headlining an amazing bill at Lo-Fi Performance Gallery in Eastlake on Friday, March 28 with our old buddies The Dolomites. The Dolomites and The Bad Things go back into the Midnite Choir days, when we were just two of maybe four bands that were doing this kind of music in the Pacific Northwest. 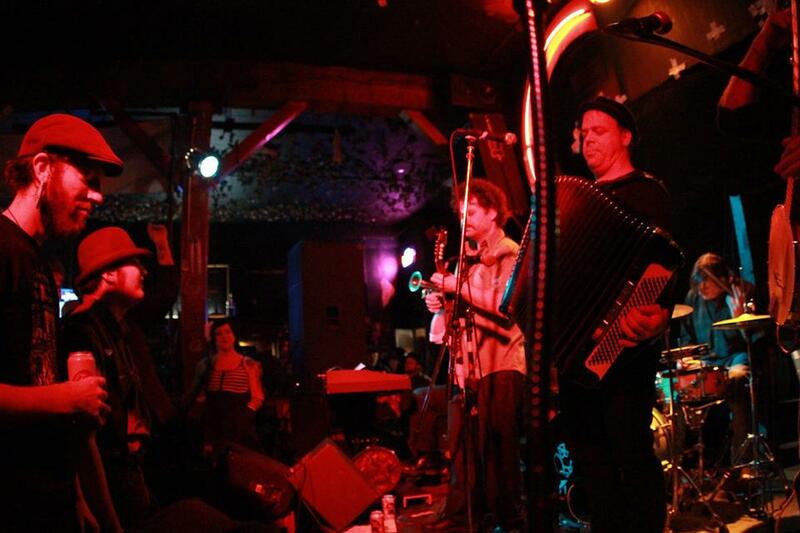 After travels to Japan, Europe and Mexico City, Stevhen Iancu, essentially the only consistent member of the band, is back to rock out on his accordion with us and Wenatchee’s Jipsea Party, who we have not seen yet but are confident will start things off in a most raucous way. After that, we’ll be hitting Columbia City with Northern California’s amazing El Radio Fantastique on Saturday, April 5th. But, more on that later. Get advanced tickets to the Lo-Fi show here and be sure to pick the Artist Ticket option as it benefits Cafe Racer Love and gets you a very cool collectible ticket, all for a mere $0.25 extra.